FEATURE: Posh signed Josh, but who else should they bring to the ABAX? Peterborough United are pleased with their summer transfer business so far. Young goalkeeper Josh Tibbetts followed striker Ricky Miller and attacking midfielder Danny Lloyds as new recruits earlier this week (May 17). There could be more to follow once director of football Barry Fry manages to offload some of the 11 Posh players currently on the transfer list. 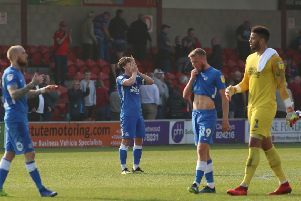 To assist the hard-working Fry, The Peterborough Telegraph have been scouring the huge list of out-of-contract players around the country as well as those who could be enticed at the right price. This attacking midfielder is going nowhere at Loftus Road and could be prised away by sweet-talking Fry, who confirmed interest in the Welsh youth international to the Peterborough Telegraph yesterday. Most of his senior appearances have arrived in loan spells at Stevenage and Swindon (twice). He’s scored, and played very well, on each of his two appearances at the ABAX Stadium for Swindon. This exciting midfielder was a star in Notts County’s surge to safety in the latter part of the League Two season. He was on loan from Nottingham Forest who now appear likely to let him leave on a free transfer. League One rivals Wigan are reportedly very keen on a man who made 20 appearances for Forest. Grant should be told it’s grim up north. The current Northern Ireland international is out of contract at Fleetwood. He’s a powerful performer - he even scored five goals last season - who might realise he’s gone as far as he can with the Cod Army. And Posh need a right-back after transfer-listing both Michael Smith and Hayden White. McLaughlin is far superior to both of those and would be a terrific addition. Posh almost signed this young forward in January on loan. He’s since had a contract extended at Swansea, but he played just 30 minutes of Premier League football in 2017 so could be available on loan. Chairman Darragh MacAnthony has stated he doesn’t fancy loaning young Premier League players any more, but he’s been known to change his mind before. McBurnie scored twice for Swansea on his full debut at Posh in a League Cup tie last season when he impressed with his quality.